Anze Kopitar #11 of the Los Angeles Kings takes a shot against goaltender Henrik Lundqvist #30 of the New York Rangers in the first period during Game Two of the 2014 NHL Stanley Cup Final at the Staples Center on June 7, 2014 in Los Angeles, California. The Los Angeles Kings and New York Rangers played more than 90 minutes of hockey Saturday night, and it was captain Dustin Brown who won it for the Kings with a goal in double overtime to give his team a 5-4 victory. Justin Williams picked up three assists in the game, and Willie Mitchell had a goal and an assist on the game-winning tally as the Kings grabbed a 2-0 lead in the series. Just like they did in the first game of the series, the Rangers came out of the gate firing on all cylinders. They had their offense going, with Rick Nash nearly scoring an early goal off a quick feed from Derek Stepan, and they also got their physical game going too, with Ryan McDonagh drilling Jeff Carter with a hip check at the blue line. They weren’t able to get an early lead during those opening minutes, but they certainly laid the groundwork for their success later in the frame. The Kings had a few chances of their own, with Marian Gaborik getting robbed by Henrik Lundqvist on a shot through a screening Anze Kopitar. Tyler Toffoli also had a short-handed chance that rang off the post, sending a collective groan through the Staples Center crowd. That missed chance ended up proving costly as the Rangers got on the board first. With Alec Martinez putting a screen on his own goalie, McDonagh loaded up with a slap shot from the point and blasted it past Jonathan Quick to put New York up 1-0. The Kings got a power play chance late in the period when McDonagh was sent off for cross-checking Dustin Brown, but they couldn’t capitalize on the chance. Martinez had the best scoring chance of the sequence when he took a stride in from the blue line and let a slap shot fly from the slot. Lundqvist gloved it down with ease and kept his team in front. With a little over a minute remaining in the period, the Rangers scored again. Matt Greene whiffed on a shot and turned the puck over for Los Angeles, and eventually it found its way to Derrick Brassard behind the net. McDonagh fired a shot from the point that hit traffic in front, but Mats Zuccarello was there to pick up the rebound, fighting off Kopitar near the blue paint and pushing the shot into the goal to make it a 2-0 game, which it would remain through the end of the first period. Just two minutes into the second period, the Kings scored a goal to make it a 2-1 contest. Lundqvist came flying out of the goal to pursue Justin Williams, but the veteran winger smartly skated back to the boards and dished a pass to Jarret Stoll. The center then feathered a shot past Lundqvist and Kevin Klein to get his team back to within one goal. Both teams traded power plays after that goal, but neither side was successful. The Rangers then got another power play when the Kings were whistled for a too many men penalty, and they were able to convert. Stepan received a touch pass at the blue line, and he ended up on a 2-on-1 rush with Marty St. Louis. The veteran winger blasted a one-timer past Quick and into the net to give the Rangers back a two goal lead at 3-1. Not to be outdone, the Kings scored a power play goal of their own a few minutes later. Dwight King set up a great screen at the top of the crease to impede Lundqvist's vision, and when Willie Mitchell unleashed a slap shot, it tickled the twine as the Kings pulled to within a 3-2 margin. Just 11 seconds later, the Rangers scored again to make it a 4-2 contest. After Quick tried to handle the puck, it popped up in the air and over Mitchell's stick. Zuccarello then won a battle for the loose puck and fed a pass to the front of the goal, where Brassard popped in a quick shot to best Quick and give his team an insurance goal. In the third period, the Kings came out firing as they attempted to get back in the game, and they got a goal early on as a result. With Dwight King jostling for position with McDonagh in front of the cage, the puck found its way out to the point where Greene blasted a slap shot. The puck ended up deflecting off of King and into the net, and despite Lundqvist's pleading for a penalty, there wasn't one coming as the Kings made it a 4-3 game. A few moments later, the Kings tied things up. Following a crazy sequence that saw the puck pinball all over the ice, Marian Gaborik eventually found a loose puck following a missed clearing attempt by McDonagh, and on his second attempt he fired it past Lundqvist to tie things up at 4-4 about halfway through the period. In the second half of the frame, both teams had their fair share of chances to score, but neither goaltender was willing to yield an inch. Lundqvist especially was tested, with the Kings' second line getting a good number of scoring chances. Jeff Carter continued to do a good job of moving the puck through the zone, but the Rangers' goaltender stood strong as regulation time ended and sent the two teams to overtime for the second consecutive game. Unlike the first game of the series, this game didn't end quickly in the overtime frame. Both sides had tremendous scoring chances, with Carter picking up a few for Los Angeles and Chris Kreider getting a breakaway chance in the late stages of the frame. Despite both teams combining for 14 shots on goal in the frame, the game remained tied after 20 extra minutes. When the second overtime began, the Kings started to push the issue once again on offense. 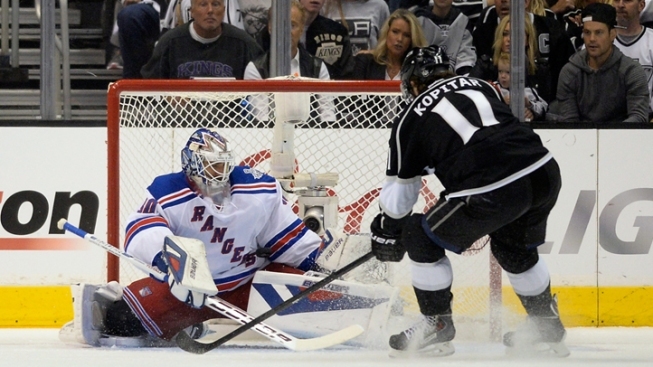 Williams had a shot blocked by Dan Girardi early on, and Doughty also had a chance denied. The Rangers did get a few shots on goal during that stage of overtime, but Quick was there to stand tall as Anton Stralman's chance from in close was denied by the sliding goaltender. Finally, the Kings established possession in the offensive zone and ultimately won the game. With Brown skating across the slot, Mitchell fired in a slap shot from the point. Brown got a stick on the shot to deflect it past Lundqvist, and in the blink of an eye the Kings had grabbed a 2-0 series lead. Los Angeles will look to put a stranglehold on the series when the two teams meet again on Monday night in the Big Apple. The game will begin at 5pm Pacific time, and it can be seen on NBCSN.